Bill Shalosky got his start working in the Smokers' Haven Workshop doing minor pipe repairs & restorations, and also made the Smokers' Haven Hand-Mades, Buckeye Pipes, & Chheda Pipes along with Premal Chheda. He is also producing his own line of pipes under the Shalosky name. These fine pipes are made from the finest cured briar, and Bill hand cuts each stem from top grade German Ebonite. In the Spring of 2015 Bill started working with Todd Johnson and Pete Prevost (Prevost Pipes) at the Briar Workshop. Bill has a background in Fine Arts, and is an experienced Bowl Turner. He is a graduate of the Columbus College of Arts & Design, and a native of Columbus, Ohio since birth. 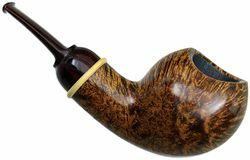 Bill is also an experienced pipe smoker & collector. His tastes range from a variety of shapes and styles, and his production has influences of many pipe makers and his own artistic designs from his studies. The most impressive aspect of his pipes, is the detail in craftsmanship. The drilling and connections are perfect, and his stems are cut very thin and comfortable. This page was last edited on 1 March 2017, at 19:50.